With last than a week to go until the EU referendum, the campaigns on both sides are now in overdrive. Since late January, we have been following the social media campaigns, particularly on Twitter, to understand better the messages that different groups are making, the way in which they frame and the extent to which their followers have been picking these up. In this post, we want to bring together our weekly analyses, to give the bigger picture. With almost 28,000 tweets from ten different groups, we have been able to draw a number of basic conclusions. 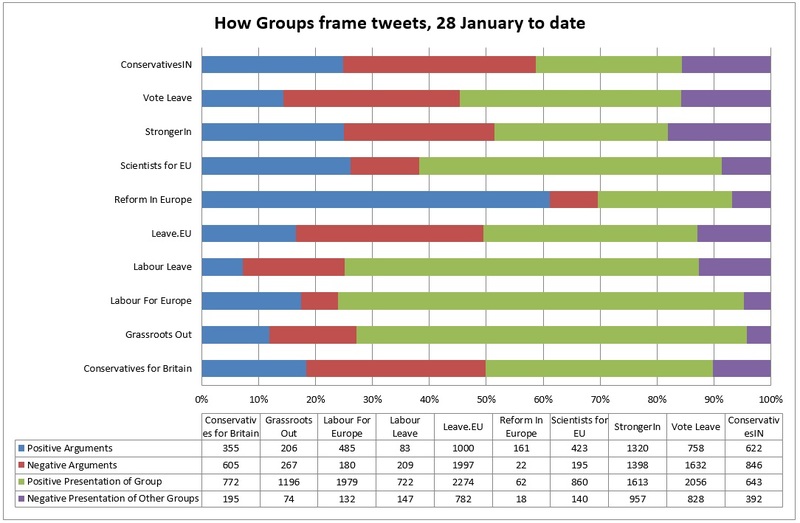 Throughout this campaign, Leave groups have been both more visible and more popular than their Remain opponents. 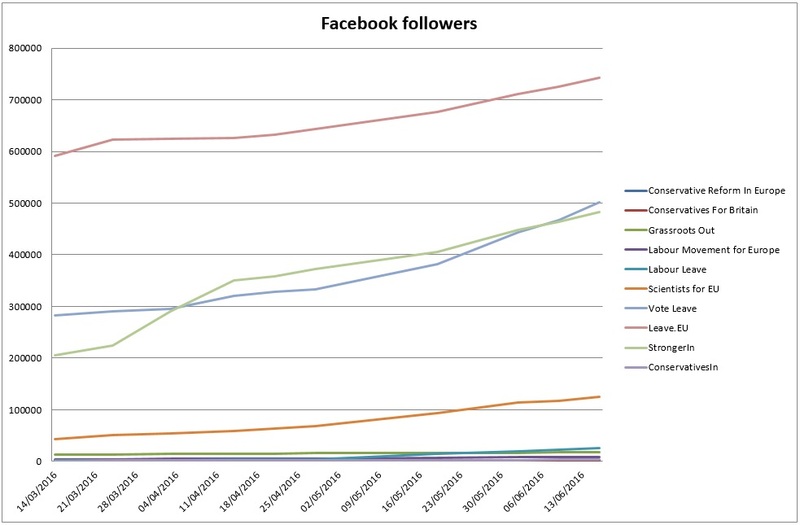 In terms of followers, this is true whether we look at the two lead groups – Vote Leave and Stronger In – or the Conservative and Labour pairs, or indeed the camps as a whole. The reasons have been rehearsed in our earlier posts, but reflect the much longer establishment of eurosceptics online, plus the more visceral nature of their campaigning. 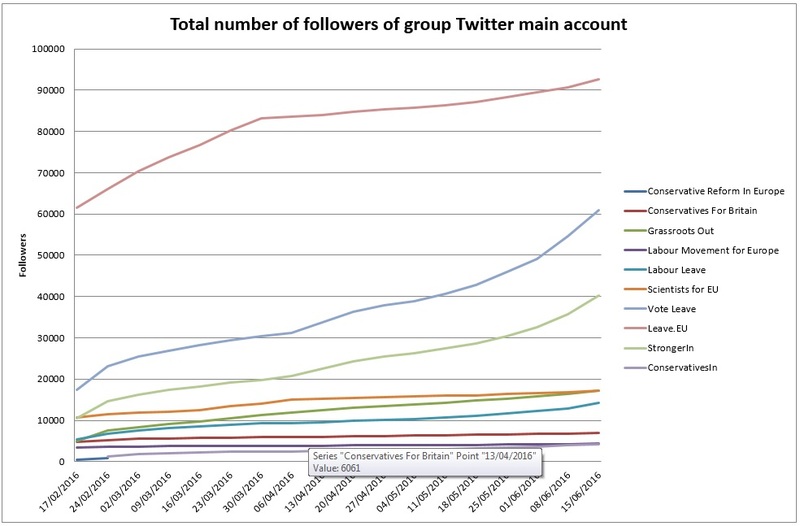 Indicative of this is the dominance of Leave.EU, which even without securing the official designation, has maintained a clear lead over any other group, with 1.5 times as many Twitter followers as all the Remain groups in our sample. The pattern is also found on Facebook. 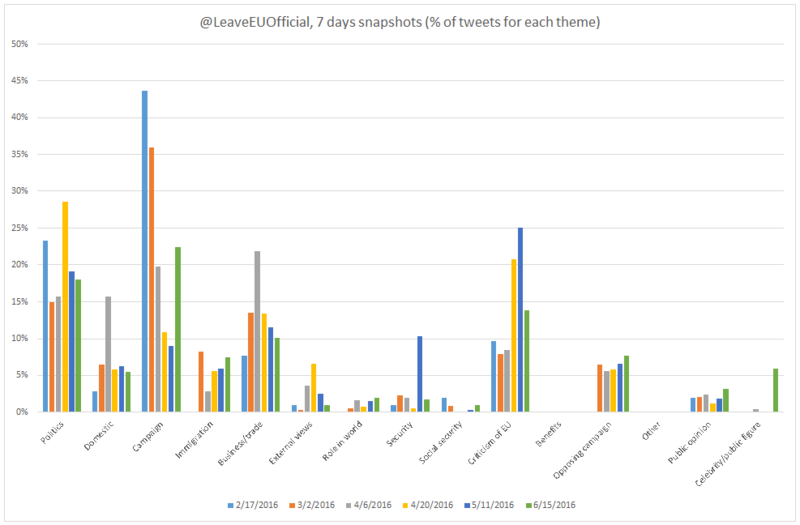 If we consider volumes of output, then the disparity is smaller, although in only two weeks in our sample period have the Remain camp tweeted more than Leave. 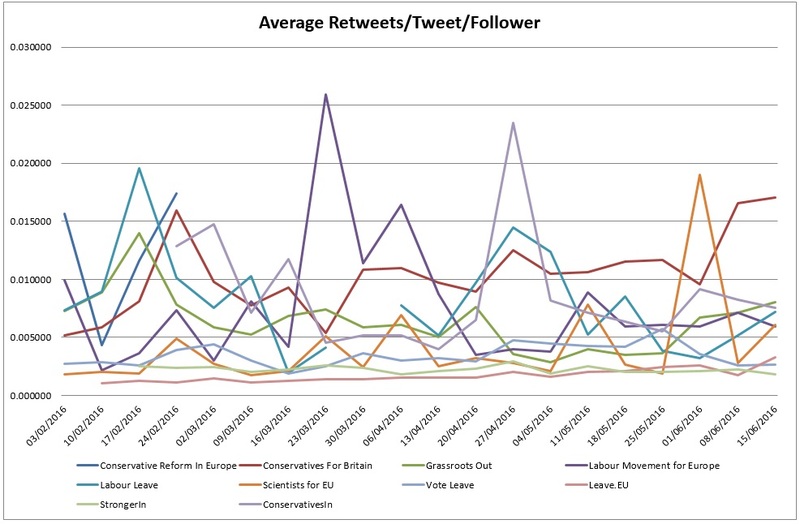 While the last two weeks have seen a massive increase in tweeting by the two official groups, this has still seen Leave produce more content. For several months now, we have been awaiting the break-through moment of this campaign, when the man or woman on the street really gets into the debate. This would be reflected in a number of markers, including increased numbers of followers and improved rates of retweeting groups’ content. However, this has not happened so far. 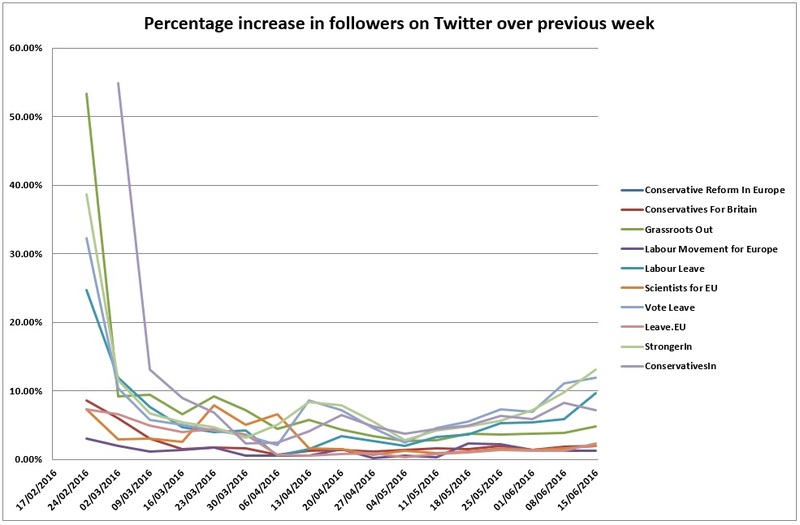 While Twitter follower growth has strengthened in recent weeks, it has not approached the rates seen around the time of Cameron’s European Council deal. This suggests that the majority of those who are deeply engaged with the issue have been so for a long time and the it remains a marginal issue for the large majority of voters. Clearly, this has implications for turnout, which looks set to be a key consideration in the outcome of the referendum. 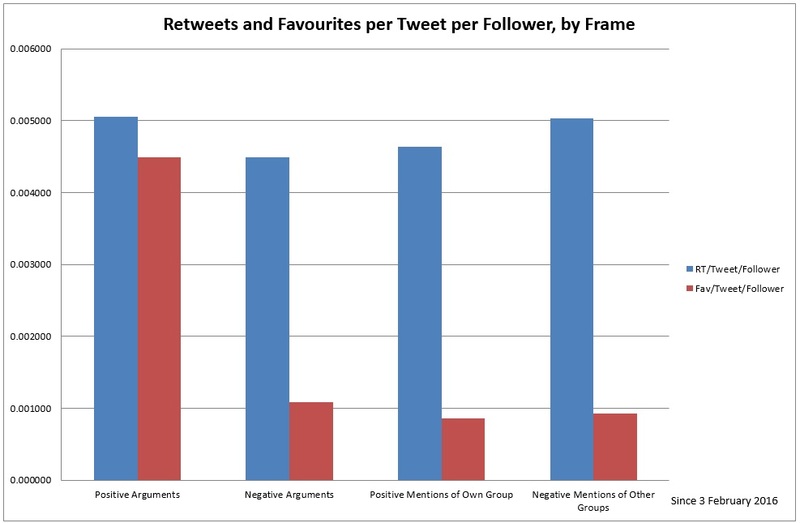 Likewise, when we consider our standardised measure for audience engagement – the average number of retweets per tweet per follower – then there is no clear movement either for groups as a whole or for individual groups. If there has been any pattern then it is that the more focused groups have a generally better rate of engagement than the broader ones. Of course, this measure masks the generally larger effect of engagement by Leave, driven by the much larger follower base. 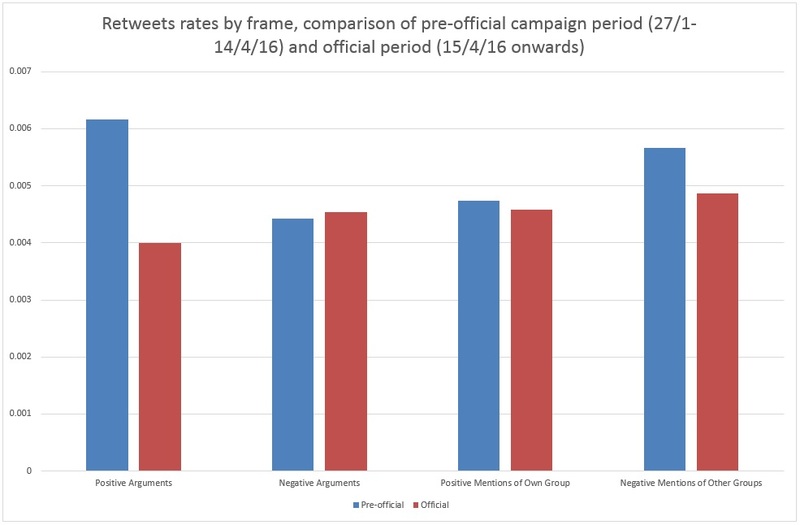 Looking at the engagement measure over time, if we compare the period before the official campaign began in mid-April with that since, then we see that rates for different type of framing generally are lower, with the partial exception of negative arguments, although this is not a significant difference. A long-standing discussion on this blog has concerned whether negative campaigning is as successful as it has been suggested for other elections. We discuss this below, but a more general observation is that both sides have become more negative in their framing over time. This has also been true of the three main groups: Stronger In , Vote Leave and Leave.EU. As we noted last week, the advent of the TV debates has contributed to this very substantially, given the scope for immediate critiquing of opponents, but the trend long predates these events. Our analysis does not yet offer up a convincing explanation for why this occurs, but it will one of the avenues that we will explore in more depth in the coming months. One possibility is that there has been a shift from generic arguments to more specific reaction to events, which produces a similar type of effect to that found with the TV debates. This shift has also resulted in a clear growth in the use of negative comments about other groups. All of the big three have seen this, again with the TV debates providing rich pickings. 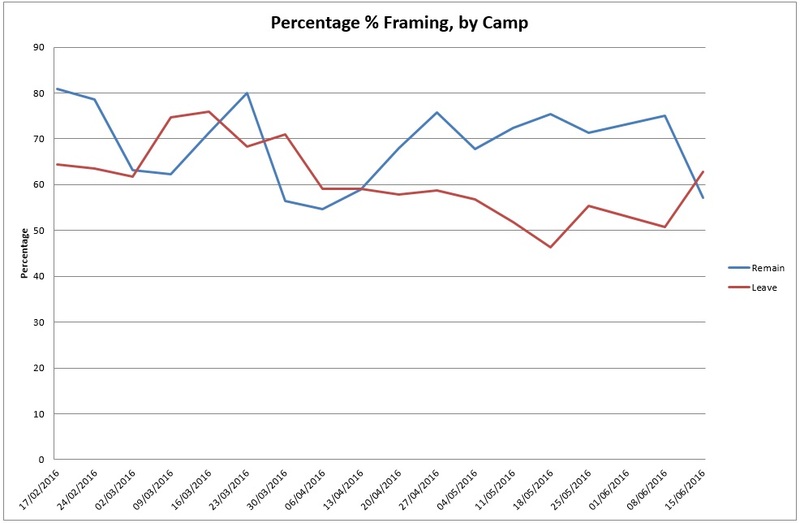 If there has been a growth in negative framing, then it has not been an unambiguous benefit to groups. Taking our sample as a whole, we do not find that negative framings clearly out-perform positive ones on our engagement measure. 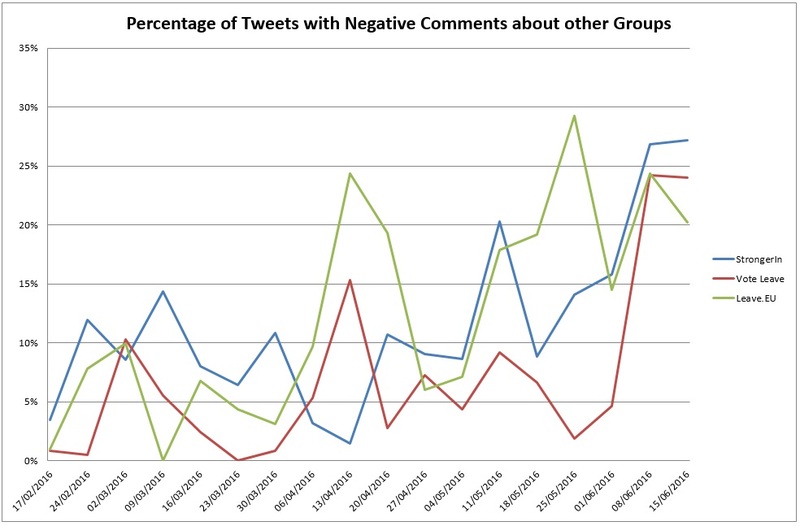 Positive arguments and negative comments about other groups are neck and neck, while negative arguments and positive mentions of one’s own group trail a bit behind. Even when we break this up by weeks, there is still not a clear pattern: of particular note would be the last fortnight, which contained the TV debates, but does not show any improvement for negative frames. 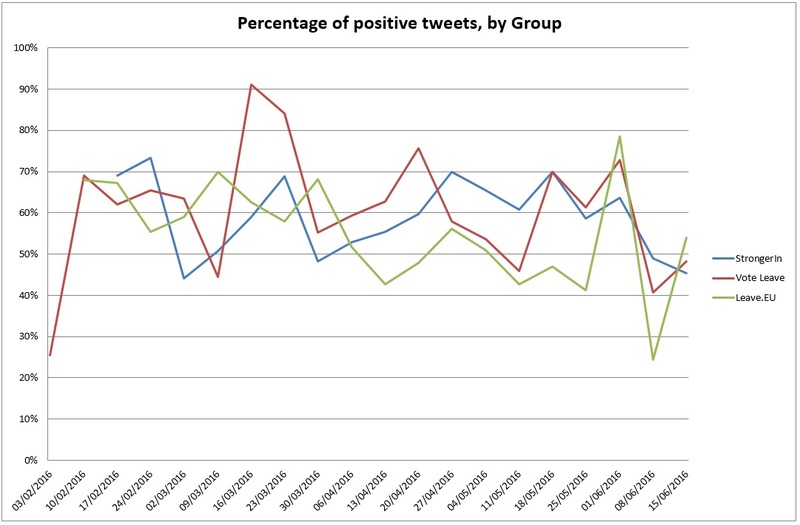 Our analysis shows that there has been some notable consistency in the way the groups have used twitter throughout the course of the campaign. 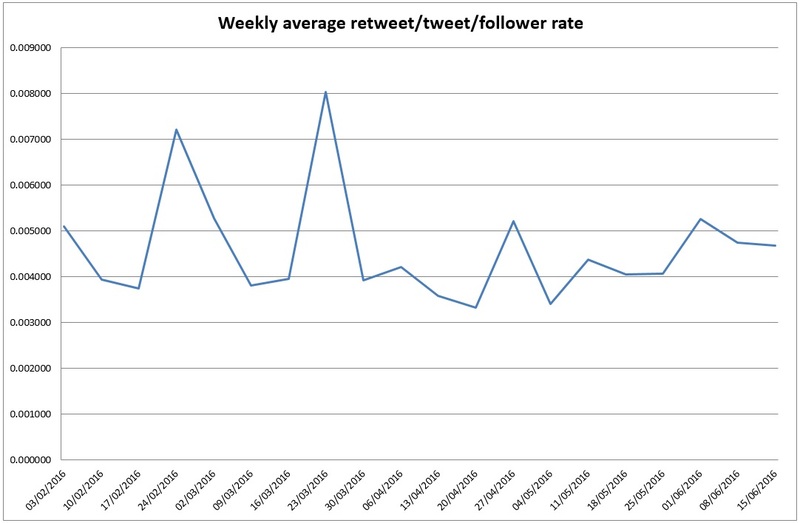 This is demonstrated in the 7 days snapshots of tweets for key time periods during the campaign, shown below. In terms of issues, Leave EU’s message has been dominated by tweets about: 1) politics; 2) criticism of the EU; and 3) business, trade and the economy. We also see a drop off in the number of tweets related to their own campaign after the announcement of the designated groups on the 15th April. 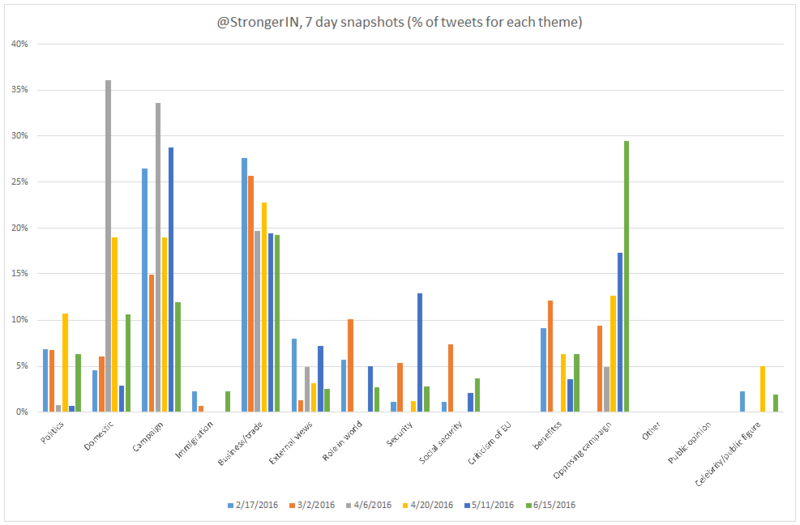 Stronger In’s twitter campaign has been built primarily around business, trade and the economy, with spikes in other issues at certain times. 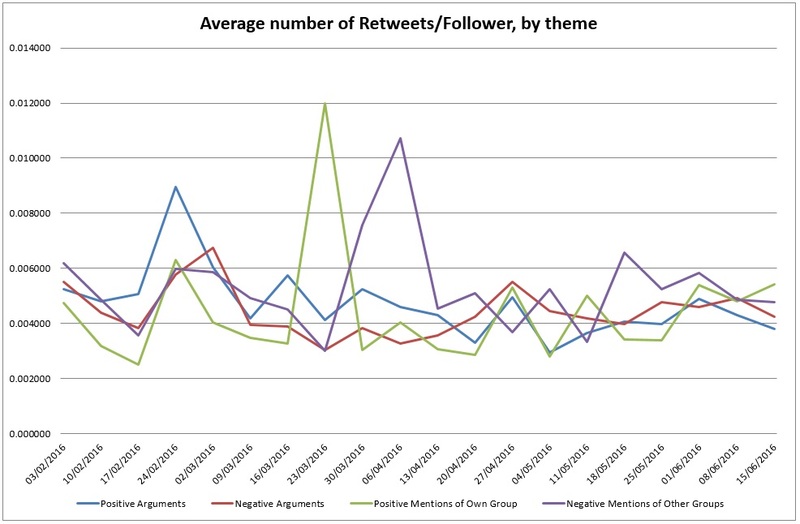 For example, at the beginning of June there is a significant jump in the number of tweets related to domestic issues. Overall, the campaign has builts its message around a core message on business and the economy and the actions of the other campaign. Vote Leave has conducted a very different social media campaign to Stronger In. It has used twitter to promote its own campaign efforts, rather than engaging the opposing campaign, or to focus on specific issues. Rather, the campaign has focused consistently on a range of issues – politics; domestic issues; immigration; business, trade and the economy; security – but none of these have come to dominate the campaign’s message on twitter. This is a contrast to Stronger In’s predominate focus on business, trade and the economy over other issues. For this most recent week we have seen a jump in tweets about the opposing campaign from both the designated campaign groups. With Stronger In dedicating almost 30% of their tweets to the leave campaign, and Vote Leave just over 20%. 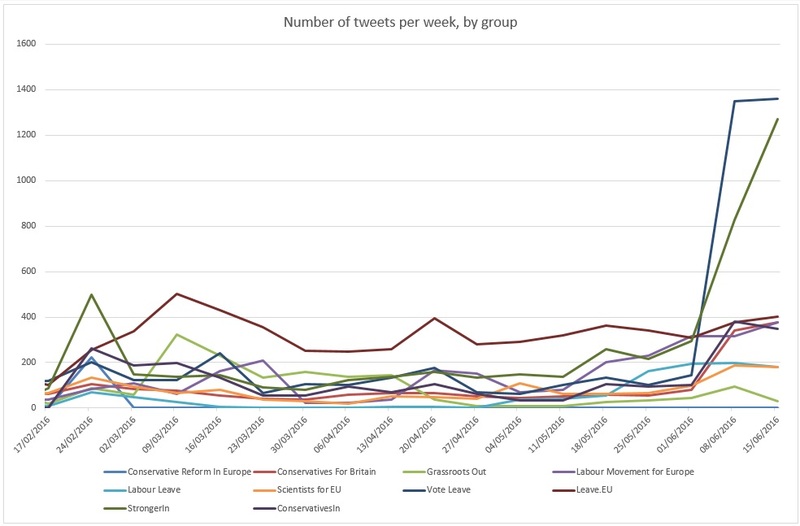 This is in part, likely to reflect the nature of the TV debates in the last week, which formed a significant proportion of the tweets from the campaigns this week and accounts, in part, for the significant increase in the number of tweets generated (see discussion above). 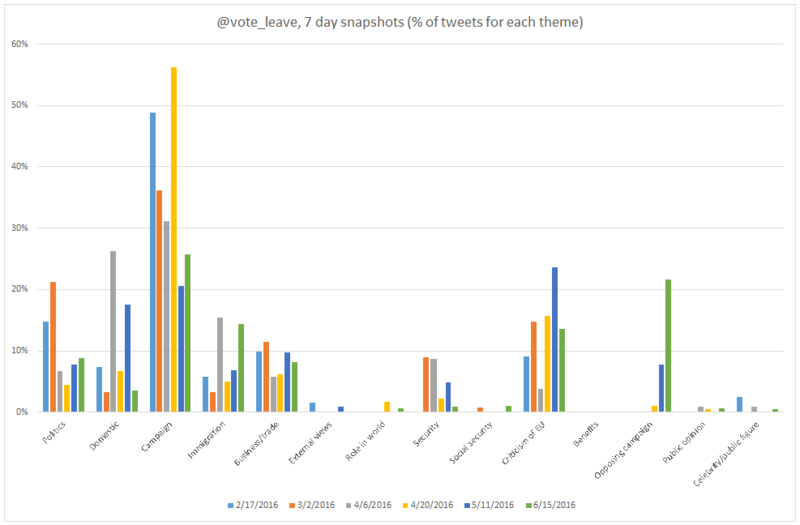 In contrast, the number of tweets dedicated to the other campaigns by Leave EU has been significantly lower, at around 2.5%.